Since a rubber packing is to block water from being leaked out outside of the door, molds and residual may form and be stuck in the rubber packing. Try to let it air-dry after using the machine and wipe it with adry cloth. If the level of pollution is very bad, then clean the rubber packing. Inspect the gray colored seal/bellow between the door opening and the basket for stained areas. Pull back the seal/bellow to inspect all areas under the seal/bellow and check for foeign object. If you find stained areas, wipe down these areas of the seal/bellow with toothpaste using dry cloth. NOTE: Wear rubber gloves when cleaning for prolonged periods. 1 Wipe the seal/bellow area using a damp cloth again. 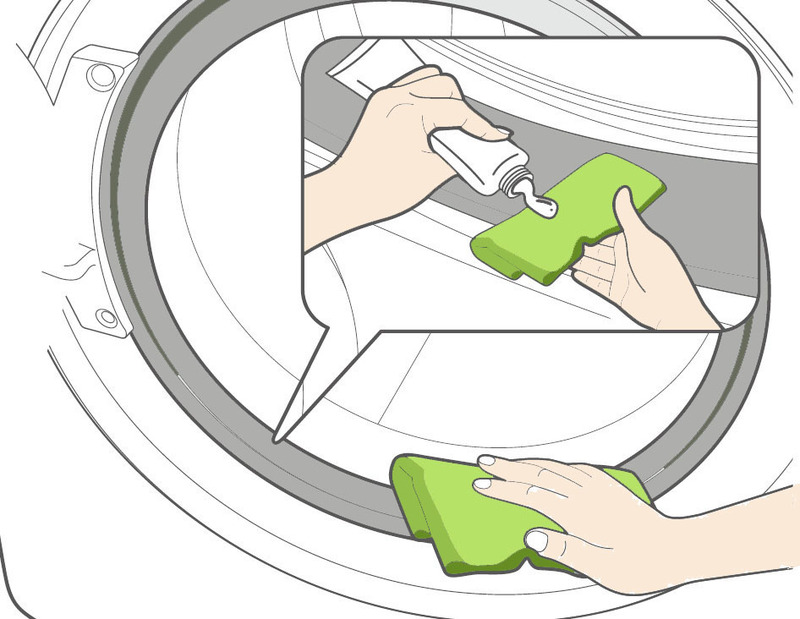 2 Wipe down the area thoroughly with a dry cloth and let the washer interior air dry with the door open.